A friend asked me recently if it is necessary to do a "program" to adapt to a raw vegan eating. She has done quite a lot of reading and has been 'vegan' for a long time. I agreed that, yes, she can "make the program" as she goes along. However, I do see that "programs" ('events' in the green smoothie world; for example, the upcoming 21-Day Green Smoothie detox) as wonderful opportunities to do a time-limited cleanse-- lots of information and group support to overcome some old, unhelpful thinking or habits with options for some new thinking and strategies for better health. 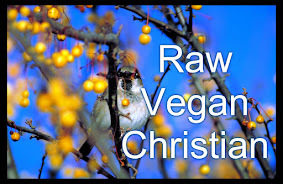 Perhaps some of the raw food 'events' can be viewed as retreats-- time to come apart from all the distractions of day-to-day life and get back on track with more resolve. The beginning of a New Year is a great time to take some time to vision and set goals. It seems to me that it is also a provident time to have some community support to sink that vision into place as the beginning of a practice one wants to set for the remainder of the year (or life). I personally find it much easier to stay on track with my daily Bible reading plan for the year if I am also meeting with people to study the Bible on a regular basis. Likewise, developing and maintaining an encouraging 'wellness' community (including people who are raw vegan) might well be key to "staying with the program." Try detoxifying your liver this New Years: Blend 4 oz. fresh orange juice, 4 oz. fresh lemon juice, 8 oz. distilled water, 5 cloves of garlic, 4 oz. olive oil, cayenne to taste (approx. 1/4 to 1/2 tsp. ), & an inch of diced fresh ginger. Take 4 oz. morning and 4 oz. evening for 3 days. Keep refrigerated and make more as needed.